Jimi’s back at the table for another round, and she’s packing some Azorius muscle to boot! 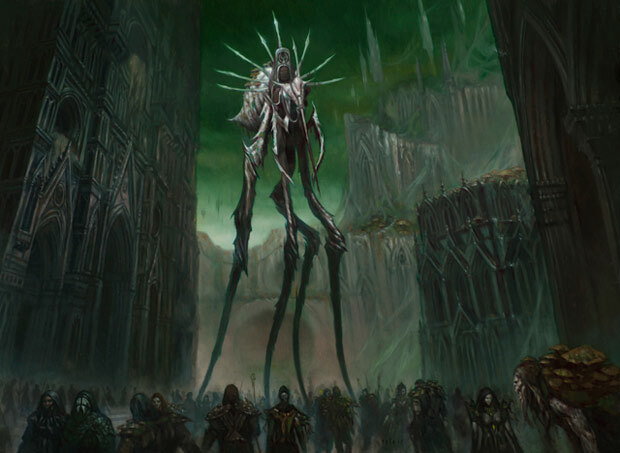 Meanwhile, we get another look at one of Ravnica’s most prominent guilds, the Golgari. Because hey, every guild gets an Intro pack, but not every guild has an upcoming Event Deck and a Duel Deck appearance under their belt! Jimi kicks things off with a Plains and passes, while I get out ahead early with a Slitherhead. Next turn, though, Jimi’s right on my heels as she deploys a Concordia Pegasus, and it’s my turn to play a land and pass. Now turn 3, Jimi sends the Pegasus in for first blood to put me at 19, then adds a Vassal Soul. I come right back with a surprise Dreg Mangler, turning it sideways to attack in for 3. Next turn, both fliers soar in for 3 damage. Jimi shores up here defensive line with a Silvercoat Lion and ends her turn. I attack again with the Mangler to put her to 14, then add a Golgari Keyrune. A turn-5 Righteous Authority on the Vassal Soul lets Jimi attack in for 5 this time, dropping me to 11. Back to me, I sac the Slitherhead to a Launch Party to blast the Vassal Soul, following that up with a visit from the Mangler to leave Jimi at 9. Next turn she keeps the pressure on with the Pegasus for 1, then summons a Stealer of Secrets. For my part, I land my foil rare- Corpsejack Menace– then scavenge the Slitherhead from my graveyard to put a pair of +1/+1 counters on the Mangler. It hammers in for 5, and Jimi’s on the way out. I end my turn with a Stonefare Crocodile. Now turn 7, Jimi brings out an Azorius Keyrune and passes. I cast Rites of Reaping, making my Crocodile +3/+3 and killing Jimi’s Stealer. In goes the Mangler, the Menace, and the Croc, and down goes the Azorius. Jimi spends her early game deploying land as I begin the offensive straightaway. An opening-turn Slitherhead is followed by a Daggerdrome Imp, but a turn-3 New Prahv Guildmage puts Jimi on the board. Bad news for her, though, is that she’s missed her first land drop. I send in the Slitherhead and Imp for 2, going up to 21 life in the process, then play the Golgari Keyrune. Now turn 4, Jimi attacks back with the Guildmage before playing a Silvercoat Lion. I return the favour in the red zone with both beaters, then play the Korozda Monitor. Next turn Jimi adds a Keyrune of her own and passes, after which I cast a Grisly Salvage. This nets me a Golgari Longlegs, seeing two land, a Disentomb, and a Serpent’s Gift off to the graveyard- no scavenge options amongst them, alas. I then attack in for 5 with the Monitor joining the Zombie/Imp tandem to leave Jimi half dead. I bring in a Walking Corpse and pass. Jimi plays a second Keyrune on turn 6, but has no other play. I fire in for 6 with nearly everything, leaving the poor Imp behind. Jimi accepts the Lion-Corpse trade, going down to 6. I replace it with the Longlegs and end my turn. Back to Jimi, she plays a Plains and passes, having long since recovered from her manabase stumble. I surprise her again with the Dreg Mangler, activating my Keyrune and sending in the pack. Jimi’s staring down 10 damage, but a timely Angel’s Mercy keeps her just above ground. At 3 life and facing my swarming army, she draws her next card and concedes. Jimi and I both trade early land drops, while I meet her second one with a Daggerdrome Imp on top of the Swamp. Undaunted, she plays a Plains and Silvercoat Lion on turn 3, while I attack in for 1 and add a Golgari Keyrune. We continue to trade blows and add creatures, with her second Silvercoat Lion being matched by my Veilborn Ghoul. Now turn 5, Jimi plays an Azorius Keyrune and attacks in for 2 with a Lion to put me at 18- it’d be lower, but for the lifelink on my Imp. I return the gesture for 5 with my Imp in the air and Ghoul on the ground. Jimi trades her hang-back Lion for the Ghoul, but is dismayed when I simply then play a Swamp from hand and pull it back from the graveyard, recasting it straightaway. Next turn, Jimi detains the Ghoul with an Azorius Arrester, finally getting to use her guild’s signature mechanic. Her remaining Lion brings me to 17, while a Soulsworn Spirit then detains my Imp. With my troops under arrest, all I can do is play a Korozda Monitor. Jimi goes on the offensive on turn 7, attacking in with the Lion, Arrester, Spirit, and Keyrune. I block the Arrester with my Monitor, which draws an answering Dramatic Rescue to bounce it back to my hand. Down to 11, I swing in for 4 with the Ghoul, taking Jimi back down to 15. I then add the Corpsejack Menace and pass. Next turn, she’s a bit more cautious, attacking on only with the Spirit for 2. I send the Ghoul back in for 4, only to see Jimi flash in a Skyline Predator and arm it with Swift Justice. This kills the Ghoul, though once again I’m holding a Swamp to get it back. I opt to play a Korozda Monitor and pass. Now turn 9, Jimi comes in hard and heavy with the Spirit, Keyrune, and Predator for 7. With me at 2, she plays a Keyrune and passes. With no way to mitigate that much evasive power, it’s my turn to fold. One of the more intriguing aspects of this second iteration of the Golgari is just how similar yet different the guild’s mechanics are. Both promote the idea of value in death, so that a card isn’t ‘wasted’ once it goes to the graveyard. For Golgari Deathcreep, even humble dredge creatures could play a vital role even if you didn’t really want them back in your hand. By triggering a dredge, you gave yourself the chance to find something even better land on the scrapheap, which you could then dredge back the turn following. Although scavenge follows a similar path, it’s a bit more direct and straightforward- you trade the fallen body of your dead creature in return for a one-shot augment for another. It’s less recursive, but much more aggressive. Deathcreep at its best was capable of brutal recursive loops, but Growth is a simpler, more combat-oriented beast. That isn’t to say it wasn’t fun to play, but most of the turns seemed to follow the customary attack-summon-pass pattern. 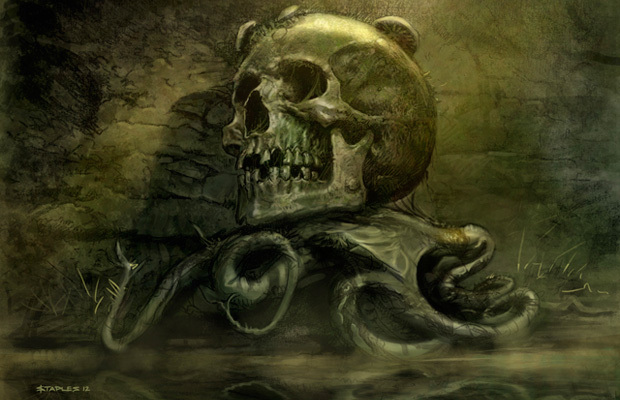 That said, I really enjoyed Golgari Growth. The deck performed very well at its appointed task, and the solid mana curve meant I was seldom at a loss for something to do. It has just enough threats and mana sinks to keep itself occupied, and the Keyrune cycle is fast becoming one of my favourite aspects to Return to Ravnica. Bridging the gap from three mana to four or five does well by decks like this, which have some expensive but powerful options, and the flexibility to become a creature when needed at a reasonable cost makes them a welcome addition. A pity, then, that Wizards declined to immortalise another by including the guild Charms. Although the decklist is fairly solid, that’s not to say there aren’t a few clunkers in here, particularly amongst the noncreature support suite. Removal is a bit tetchy, but as we’ve noted previously this seems to be a trend started in Innistrad that’s being continued here- an understandably allergic reaction in the wake of the “free removal for all!” Dismember era. Serpent’s Gift is as dodgy as dodgy gets, and more than once I found myself holding overt recursion options like Disentomb and Treasured Find and not really finding a good use for them. Since many of your creatures want to be dead, in a sense, they’re a bit less useful than they might otherwise be. All in all, Golgari Growth is a keeper, and makes us look forward all the more to the upcomging Event Deck right around the corner. This is a great Intro Pack deck. ← 2011-12 Precon Championships: Make Your Predictions! Golgari is surprisingly aggressive. I agree about scavenge, at the prerelease I played against three base-black decks and the scavenge ability was hardly used. But most scavenge creatures are costed pretty efficiently anyway (Drudge Beetle/Runeclaw Bear, Korozda Monitor/Bull Elephant, Golgari Decoy/Prized Unicorn) so it’s more of a random bonus. It;s the new email. Any changes to what you normally enter to post a comment cause it to go to the hold queue for us to approve. Sorry about that! Oh, ok. Good to see it’s not a problem with my computer. I truly do love the menace! I originally dismissed slitherhead until I played him in the intro pack. The two work wonderfully together and the first tweak to the deck would be to add another pair of heads. Fun deck though and glad to see it take the win over those staunchy lawmakers!